That is, the results contained a table called ttest with the title ‘Independent Samples T-Test’, with 4 columns and 1 row. In practice however, the number of rows in the table often isn’t fixed. They may vary based on the options the user has selected, or based on the results of the analysis itself. In this tutorial, we will concentrate on the former. The first thing we need to do is change the dependent variable in the .a.yaml file, from Variable to Variables. type: Variables             # <-- Variables with an s! NOTE there is currently a bug in jmvtools, where the UI is not updated appropriately. In this scenario, jmvtools should update the .u.yaml file to accept multiple variables, however this does not happen. It is possible to update the .u.yaml file by hand, but it’s generally easiest to simply delete the .u.yaml file, and let jmvtools create one from scratch. This is something which will be fixed in the coming weeks. NOTE that you will have to shut jamovi down, and restart it in order to see changes to the analysis UI. 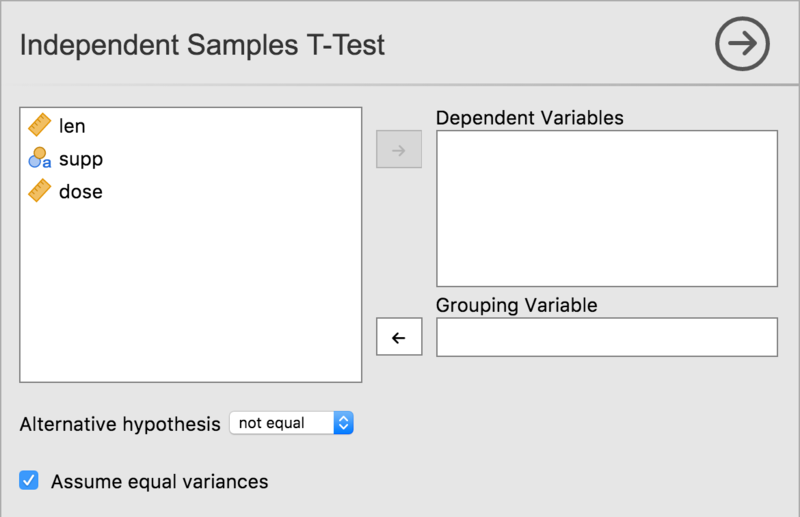 As we have changed the name and type of the dep variable, our t-test will no longer work. For now, you should comment out or delete the content of the .run() function of the t-test analysis, otherwise it will produce a number of errors. We will return to it later in this tutorial. As can be seen, multiple dependent variables can now be specified. What we now want, is not 1 row, but rather 1 row per dependent variable. If one variable is assigned to the option deps, then we want the table to have 1 row. If two variables are assigned to the option deps, then the table should have two rows, etc. The way we do this, is with what’s called ‘data-binding’. Data-binding is where we ‘bind’ a particular property of a results object, to an option. In this case, we want to ‘bind’ the number of rows to the deps option. We do this be specifying the option inside of parentheses (or brackets). As can be seen, our table grows and shrinks accordingly. But we can do one better. The first column should contain the variable name, and although we can add this using the Table’s setRow() function, there is a better way to do this. We can specify the content of the column in the .r.yaml file. content: ($key)  # <- here! $key is a special value which maps to the row’s key. Make this change, and reinstall the module with jmvtools::install(). As can be seen the first column is now filled in appropriately. Data-binding is nice, because it often leads to much simpler code. The .yaml files are able to take care of a lot of aspects of the results objects, and allows the R code (in the .b.R files) to be much simpler, and focused on performing the calculations. In computer science, this is called separation of concerns. Now all we need do is add our analysis implementation to the .b.R file. We can fill the table in using either the rowKey or the rowNo. table$setRow(rowKey=dep, values=list(  # set by rowKey!